SAN FRANCISCO, CA--(Marketwired - Oct 8, 2013) - The Ritz-Carlton, San Francisco, a AAA Five Diamond hotel in the heart of downtown, continues its series of interactive, engaging and delicious culinary tours this fall and winter, led by Bay Area broadcast veteran Liam Mayclem. The Inside the Kitchen culinary tours, originally introduced in July, are exclusive, behind-the-scenes excursions that showcase the craft, talent and history of San Francisco's remarkable food and beverage community. Offered to hotel guests and members of the community throughout the year, the next series of tours will take place on November 10, November 16, December 7 and December 14. Curated by expert guide Mayclem and featuring notable local chefs, artisans and bartenders, each Inside the Kitchen tour will explore a different theme -- from San Francisco's cultural history and food legends to craft cocktails and holiday entertaining. The Inside the Kitchen tours are inspired by San Francisco's neighborhoods, as well as the city's food history and current trends. Each tour includes round-trip luxury transportation from The Ritz-Carlton, San Francisco, at least four tour stops with complimentary tastes and fun surprises along the way, special keepsake mementos, a Ritz-Carlton signature tote and, at the conclusion of the evening, an optional four-course group dinner at Parallel 37, the acclaimed Union Square restaurant, by Chef Michael Rotondo. Valencia Street, in the heart of San Francisco's Mission District, has become a hotbed of culinary talent and innovation over the past several years. This tour goes inside some of the area's most buzzed-about kitchens, starting with a taco-making session at Tacolicious. Dandelion Chocolate follows, for a tasting and chocolate factory tour, then onto The Abbot's Cellar for a craft beer pairing. The final stop is the modern Craftsman & Wolves to learn the secrets to a perfect pastry with chef and owner William Werner, before returning to The Ritz-Carlton, San Francisco for the optional dinner in Parallel 37 at 5:30 p.m. This tour highlights the treasured culture and cuisine of China. The tour includes stops at City View for a dim sum lunch, followed by an educational tea tasting at Green Leaf Tea. Then it's onto the Golden Gate Fortune Cookie Factory for a cookie-making demo and tasting. Venture from the traditional to the modern with the final two stops, at celebrity chef Martin Yan's M.Y. China for a noodle pulling demonstration and tasting, and Hakkasan for cocktails and dessert bites with Chef Courtney Lewis. The tour concludes back at The Ritz-Carlton, San Francisco, just minutes from Chinatown, with an optional group dinner at Parallel 37 created by Chef Michael Rotondo at 5:30 p.m. The Ferry Plaza Farmers Market and Ferry Building Marketplace are two must-visits during the holidays, whether you're preparing a feast or shopping for special gifts. Start the day with Parallel 37's chef, Michael Rotondo, who will guide guests on a special shopping spree for ingredients he'll use in the restaurant that evening. Then it's on to lunch, provided by gourmet food truck Roli Roti, where Chef Thomas Odermatt will share his secrets to tasty herb-infused rotisserie chicken. The adventure continues with stops at Cowgirl Creamery for a VIP cheese tasting with one of the company's legendary founders, Sue Conley; Recchiuti Confections, where guests will hear the secrets behind this remarkable San Francisco-made chocolate; and Hog Island Oyster Co. for oysters and Champagne. Guests will have an additional 45 minutes to shop on their own along the Embarcadero before heading back to The Ritz-Carlton, San Francisco for an optional four-course group dinner in Parallel 37 by Chef Rotondo. Known locally as the KCBS Radio "Foodie Chap" and Emmy Award-winning host of "Eye on the Bay" on CBS 5, Liam Mayclem began his broadcasting career in London, England. He has cooked with the world's top chefs, including Thomas Keller, Jamie Oliver, Jacques Pepin, Nigella Lawson, Martin Yan, Roland Passot and many more. He also leads international culinary tours and has upcoming trips with AAA to Japan, Taiwan and Thailand. Each Inside the Kitchen tour is $199 per person, with a maximum of 12 guests per tour. The four-course dinner in Parallel 37 is $100 per person, including beverage pairing, tax and gratuity. Reservations are are required in advance. There is a 48-hour cancellation policy. Tour itineraries are subject to change. For reservations and additional information, please call Melissa Loos at 415-773-6199 or visit www.ritzcarlton.com/sanfrancisco. 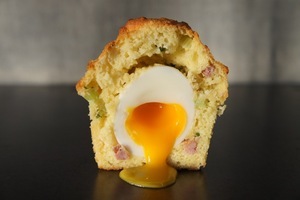 The Rebel Within is Craftsman & Wolves' asiago cheese and sausage muffin with a perfectly poached egg hidden inside.